The full story on MidWeek website can be found here. Written by Nicole Kato. 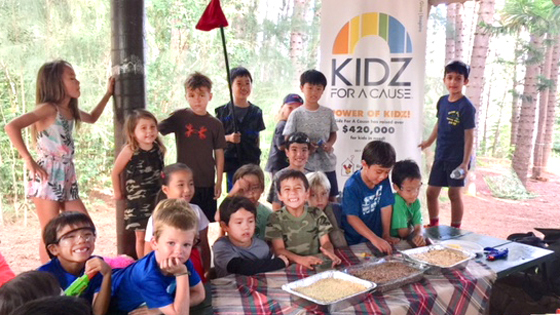 Ronald McDonald House Charities of Hawai‘i is getting quite the 30th birthday present from hundreds of keiki from around the state through Kidz For A Cause. And the undertaking has come full circle for founder Nicki Lee, who established Kidz For A Cause nearly a decade ago when she was only 8. It started when Lee’s elementary alma mater, Hanahau‘oli School, encouraged its students to do something good for the community. She utilized her love of performing to put on a concert and raised $1,100 for a charity of her choice. Mom Cathy gave her a list of three keiki-minded organizations to donate to — one of which was Ronald McDonald House Charities of Hawai‘i. Admittedly, Lee initially picked Ronald McDonald House Charities of Hawai‘i because she thought she would get to meet Ronald McDonald at his house. She laughs about it now, but is grateful for her choice, as she was able to learn more about the good work the nonprofit does for children. Lee is getting her wish this year, her last before she heads off to college, and the timing, she says, was perfect. So far, the campaign, which wraps up in March, already has raised approximately $70,000 for Ronald McDonald House Charities of Hawai‘i. The kids are well on their way to reaching the lofty goal of surpassing last year’s $300,000 total. Coming up are an indoor soccer clinic, fashion show, craft fair and film festival — all organized and run by kids. Also planned is a Saturday concert (5-9:30 p.m. at Mid Pacific Country Club) with headliners like Miss Hawai‘i 2016 Allison Chu (opera), Malia Delapenia (belly dance) and Danny Kaleikini, as well as troupes of hula and Tahitian dancers. Individual seats are $50 and can be purchased by emailing fanddkennedy@hotmail.com or calling 728-2454. Ronald McDonald House Charities of Hawai‘i holds its annual gala Nov. 18 at Sheraton Waikiki Resort, under the theme “Share a Night.” A silent auction and country store open at 5 p.m., and the dinner/ program follows from 6:30 to 9:30. Al Waterson will emcee, and guests can expect performances by Robert Cazimero, Augie T, Nā Leo, Taimane, Jordan Segundo and Kaylee Shimizu. Attendees should dress in cocktail garb or Hawaiian chic. For tickets or to make a donation, visit ronaldhousehawaii.org. There also is an option to sponsor a table for Ronald McDonald House families.